To be honest, I didn’t expect Dante Aligheri’s Inferno to be what it is when I first picked it up. It was originally written circa 1300 before the Middle Ages truly ended, has strong Christian values embedded in them, and seemed innocuous, or at least as innocuous as a book about hell can be. When I read the plot summary of Dante’s Inferno, it appeared as just another pedantic, abstruse epic. I only gave it notice because my English teacher assigned my class to read at least 500 pages for the quarter, and we could only choose books from a college-approved list of classics. Dante’s Inferno just so happened to be on that list, and I just so happened to have coincidentally checked it out from the library the previous week. Rather than find a book that I may have had more of a predisposed interest in, I chose to just read the translation and its sequel, the Purgatorio. I was not ready for some of the gory parts, the horrible punishments handed down to people, and how Dante seemed to care more about himself and either harass the sinners or break down crying/swooning (but ultimately doing nothing useful). Then again, this is only an allegory, so everything is symbolic and Dante is only using his imagination. Although by today’s standards Dante is ultra-conservative, at that time Dante was actually progressive, being one of the first to use colloquial Italian instead of Latin and combine both Judeo-Christian values and Greek mythology. The John Ciardi translation is highly compact. Somehow, he managed to fit text that normally takes up 500 pages into a tiny, 300-page book with a rather tedious font and font size. The Inferno is essentially a very long poem, divided into 34 cantos (chapters). A summary of the events precedes every canto and around three pages worth of footnotes comes at the end. These help clarify many, many fine details that would otherwise go unnoticed. As well as the translation of the poem, John Ciardi’s version of the book also features a lengthy introduction, guide to the book, translator’s notes, information about Dante’s life, etc. If you’re in for a good read, make sure to skip these parts; but if you’re reading it for school, like me, try to at least skim them over. As far the actual book goes– being irreligious, I at first tried to detach myself from the content of the book. But a few cantos in, I realized that no sane person could possibly agree with what Dante’s view of the perfect world. 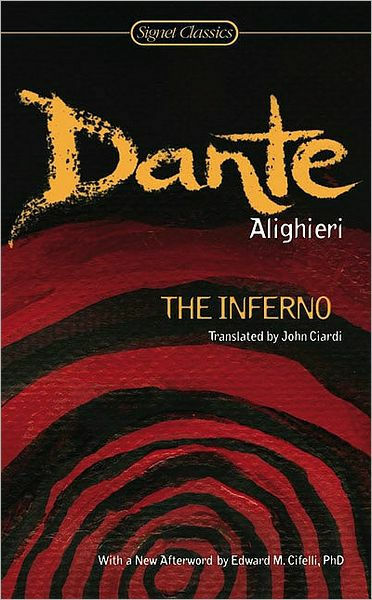 What is different about the Inferno is that it is written almost in a second-person perspective; Dante is the narrator and a character in the book. The book is essentially about Dante realizing he is straying from the “Glorious Path” towards heaven and masochistically putting himself through hell to see all the horrible things that happen to such people so that he himself wouldn’t become one of them. Along the way, he is accompanied by Virgil, a wise Greek philosopher that unfortunately ended up in hell because he wasn’t Christian. In each part of hell Dante encounters either a mythical Greek character, infamous historical figure, or somebody he knew personally. Here’s how Dante organizes hell: in the many, many circles of hell, people are handed their punishments depending on their worst sin in life. For example, hoarders and wasters are sentenced to circle four where they eternally lunge weights at each other, each trying to win against the other side but always failing to do so. I’ll admit that this is rather clever, although more than a little drastic. However, there are also many other circles of hell made especially for some people that I believe do not belong in hell. For example, heretics, or people who did not adhere to Dante’s religion were punished by being placed in an open coffin that burns for all eternity. That would be me, and quite frankly that’s the most boring and unimaginative punishment in the entire book. Even worse, if you commit suicide, no matter how noble you were in life or how justified your suicide is, you ended up as an immobile tree that bleeds blood when hurt and isn’t able to talk unless someone snaps off a branch. So even if you were a humble, God-fearing, moral human being that was being tortured or tormented, you must not commit suicide and instead bear the pain because otherwise you were a coward that deserves to burn in hell. Justified? What may be the goriest, most horrifying part of the book is the first part of Canto 28. The “sowers of religious discord”, or essentially the proselytizers that tried to convert people of Dante’s faith, are faced with a demon. They walk around in a circle without rest, and every time they come near the demon it swings its melee weapon and cuts through the body of the “sinner”, sometimes to the extent where all the inner organs are dangling out of the body. The victim then stumbles away, only to have his/her wounds heal and repeat the cycle yet again. Dante takes extra care in describing the wounds inflicted on people and the sounds of their screams, yet doesn’t seem too perturbed. Is this justified? Because to me, it’s obvious that Dante is just letting his inner sadist take over. And people praise this as a classic, honoring Dante as the best poet to ever come out of Italy? For me, this is quite disturbing. Aside from that, there is no real progression of events for the majority of the story; Dante spends most of his time trudging through hell, swooning, walking some more, assaulting the helpless, screaming, reasserting his good Christian-ness, climbing some more cliffs, crying, and being incredibly sappy one moment and psychopathically violent the next. Hopefully the Purgatorio will include an actual plot. What saved the book for me was how beautifully it was written. Even though I read the English translation, which meant much of the details and allusions were lost in translation, John Ciardi painstakingly translated every word, managing to keep the original terza rima rhyme scheme, preserve the wonderful imagery and most of the finer details, and create a vivid, somewhat realistic world all at once, even if much of the words and syntax comes across as rather esoteric. When you read the stanzas out loud, the words all flow together and the transitions and rhymes are both smooth and memorable. For this reason alone, I’ve actually become interested in learning a little bit of Italian to read the original. But that’s as far as it goes. In the end, I don’t recommend Dante’s Inferno to everyone (or even anyone) because the read can be rather slow, dull, confusing and horrifying at times, but if you want some ideas on how to write a descriptive, vivid poem, I suggest you do consult Mr. Alighieri, because he does knows how to create a work of art. Dante Aligheri’s Divine Comedy is available for checkout from Mission Viejo Library. This entry was posted in Book Reviews and tagged allegory, Dante Alighieri, divine comedy, epic poem, hell, inferno, paradise, purgatory by MichaelZhang. Bookmark the permalink.